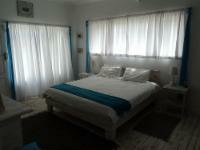 La Casetta Guesthouse is a charming and warm guest house in Swakopmund's neighbourhood of Vogelstrand. The guest house is ideally located only a stone’s throw away from the new waterfront development and beach. There are six lovely rooms all tastefully decorated, spacious and well equipped. Each room has an en-suite bathroom, TV with selected DStv channels and free Wi-Fi. Breakfast is included in the rate. Guests can make use of the communal areas on the ground floor. This includes a big lounge, ideal for book reading, meetings, or simply enjoying a coffee or tea on the balcony. Additional services include a laundry services, daily housekeeping services and dinners, just to mention a few. * 50 percent of the total amount will be charged on the day of booking. * Where no credit card is provided upon making the booking, the booking will be amended to provisional status for a period of 72 hours to allow sufficient time to deposit / electronically transfer the deposit. * Any Cash deposits do attract cash handling fees by the relevant banking authorities and will be for the account of the client as per banking policies. * Early terminations/departures will not be refunded. * Deposits for Confirmed bookings, which resulted in a no-show, due to incorrect arrival and departure dates given at first, will be handled and treated as a No-Show, and the deposit cannot be carried over to the new or amended dates. * The balance of the booking/accommodation invoice will be settled upon check-in. * Any additional surcharges accrued during the stay, must be settled no later than at departure. * Avoiding payment, is seen as fraud and will be reported to the authorities. * Prior / Special arrangement only for later payment, will accrue 6% interest immediately. * One child from 0 to 3 years is charged NAD 0 per person per night when using existing beds. * One child from 4 to 12 years is charged NAD 200 per night in an extra bed. * One older child or adult is charged at normal adult price. It is widely advertised by all establishments that they do offer DSTV to clients, but should be noted that it is not financially viable to offer the entire full bouquet, therefore a specially selected few channels are already set up on TV stations. All Self-Catering Units / Bed & Breakfast rooms on-site have individually been equipped with a DSTV decoder offering the DSTV Hotel Bouquet. (All movie, sport, selected reality, actual, local tv stations, news channels and additionally, Boomerang channel for the toddlers) the standard number of TV channels, that local accommodation establishments offer are only 4 channels. Please consult reservations for more information. * Please refer to pictures and descriptions of all units before confirming, or do request specifics from reservations * team. * All our units are no-smoking and according to Government Laws in effect from 01/07/2014 smoking is banned in public areas. * Please reduce noise levels from 22:00 as a courtesy to other guests. * Only registered guests allowed. Should it be noted that more guests stay over than registered, this is seen as fraud and will not be tolerated. The additional and suitable charges will be charged accordingly. * All invoices will carry a mandatory N$25 admin fee. * Unfortunately no booking can be confirmed with American Express or Diners Club, Only VISA and MASTER CARD allowed. * Should any apartment key(s) be lost whilst in possession of the client, will result in a key replacement fee of NAD 250 being charged. * Any breakages/damages being reported during the client's stay, or any inventory items found to be missing/lost after the client's departure, will result in the replacing of the said items, to be charged to the client's account, and the original invoice be forwarded to the client for record purposes. * Laundry Services available, washing, tumble drying and ironing, no responsibility or liability can be taken by establishment. It is required of the client to read and sign this document, and return the signed copy to the establishment. Refusal of any responsibility or signing hereof, can have certain consequences with regards to the right of entrance to the establishment being denied. Herewith I declare that I have read the listed Terms, Conditions, Policies and General Information as per La Casetta Guesthouse's policies, and herewith are rightfully informed thereof. La Casetta Guesthouse, Swakopmund is 3.6km from the centre of Swakopmund , the nearest airport 39.4km (Walvis Bay Airport).